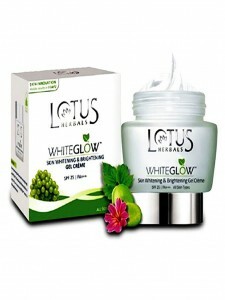 Get a radiant and flawless skin with the Lotus Herbals Whiteglow skin whitening and brightening gel cream. Infused with several fairness agents such as grape, mulberry, saxifraga extracts and milk enzymes, this Lotus Whiteglow cream is sure to nourish, moisturise and brighten your skin. This Lotus whitening cream, which is a blend of cr�me and gel, will give you fresh-looking, fair and radiant skin. The SPF 25 content of this Lotus white glow gel cream protects your skin from the harmful rays of the sun. The Lotus Herbals Whiteglow cream makes a perfect addition to your makeup kit and to your daily beauty regime. Apply it on your cleansed face using gentle strokes to achieve a smooth and even finish. It blends quickly on your face and makes you look radiant and fresh. For best results, apply the Lotus whitening and brightening gel cream all over your face and neck at least two times in a day. Perfect for use during summer, this Lotus Herbals Whiteglow skin whitening cream is a must-have for every beauty conscious woman. Moisturizer seems simple enough. It comes in a jar or a tube, and once or twice a day you slather it onto your skin. However, if you’re applying it wrong, it’s about as beneficial as that bottle of multivitamins that sits in your cupboard but never gets opened. Basically, it’s not doing much. Applying your moisturizer correctly. On the other hand, boosts hydration in your skin, prevents flaking and dullness. Plus, proper application of a face cream will help anti-aging ingredients work better — increasing the odds that they’ll work. So, if you think you’re doing everything right, you might be surprised to learn that you could be moisturizing better. And with a few small tweaks to your routine. You really can get through the winter without chapped, dry skin — all you need is your trusty jar of lotion and these rules.